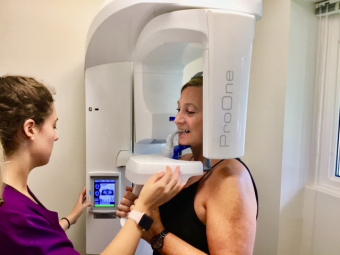 We are pleased to now have a Panoramic Dental X-ray machine in our Lorne Park Dental Associates office in Mississauga. This specialized unit allows us to capture one image of an entire mouth. It is helpful to our dentists as they diagnose and monitor dental issues or plan needed treatment for our patients. Panoramic radiography, also called panoramic X-ray, is a two dimensional (2-D) dental X-ray examination that captures the entire mouth in a single image. It includes the teeth, upper and lower jaws, surrounding structures and tissues. Although the jaw is a curved structure similar to that of a horseshoe, the panoramic X-ray produces a flat image of the curved structure. Unlike a traditional X-ray where the film or sensor is placed inside of the mouth, the film for a panoramic X-ray is contained inside of the machine. This is helpful to those who have a sensitive gag reflex. A panoramic X-ray exam is painless, fast and easy to perform. Panoramic dental X-ray is a commonly performed examination and a helpful diagnostic and dental disease managment tool. It covers a wider area than conventional dental X-ray and as a result, provides valuable information about the sinuses, tooth positioning and tooth impaction (including wisdom teeth), bone abnormalities (cysts or tumors in the jaw bone), advanced periodontal disease (gum disease that involves the bone), and jaw disorders (also known as temporomandibular joint or TMJ disorders). This examination is also used to plan treatment for braces, tooth extractions, dental bridges, full and partial dentures, and dental implants. What does Panoramic Dental X-ray equipment look like? The panoramic X-ray machine consists of two sides. An X-ray tube is mounted on one side and the x-ray film or a detector on the the opposite side. The patient's head is positioned between the two using chin, forehead and side rests. A bite-blocker is provided for the front teeth to gently bite into and rest on. This keeps the mouth open slightly for a clearer picture. Our Lorne Park Dental Associates' team enjoyed our recent training/review session. How is the Panoramic Dental X-ray procedure performed? During a panoramic X-ray examination, the X-ray tube rotates in a semicircle around the head, starting at one side of the jaw and ending at the other side. Rather than placing a film inside the mouth, a panoramic X-ray machine projects a beam through the patient onto a detector film rotating opposite the X-ray tube. The image is a digital file that is stored electronically. The digital format allows our dentists to adjust and change the contrast and brightness and darkness of the image for better visualization of certain structures and tissues. A patient is situated in the center of the unit. The unit can be adjusted to accommodate a patient standing or sitting in a chair/wheelchair. The head is carefully positioned. A bite-blocker is placed in the mouth to ensure proper alignment of the teeth. You will be asked to remain very still while the rotating arm travels in a semicircle around the perimeter of your head and the images are being taken. This can typically last between 12 to 20 seconds. Our Lorne Park Dental Associates team is pleased to have our new Panoramic Dental X-ray machine. It's another great addition to help us care for our patients even better in our Mississauga dental practice !